Moroni, known for the strength of his naturalism, is considered one of the most skilful portrait painters of Cinquecento. Far from the courtly manner of Titian, the artist from Bergamo recreates human nature in a new perspective, original and natural. His customers, most of them people belonging to the prosperous estate of the Lombard province, are depicted in the customary for them concrete environment of daily life. Images, endowed with deep humanity, are skillfully conveyed by the artist through their physical appearance and the psychology of behavior. Abbess is depicted on a gray background, which emphasizes the monumentality of her figure and tells the whole composition a certain severity. Muted ashy tones, however, become brighter behind the woman’s back, focusing on the gray head in the veil of fine work. 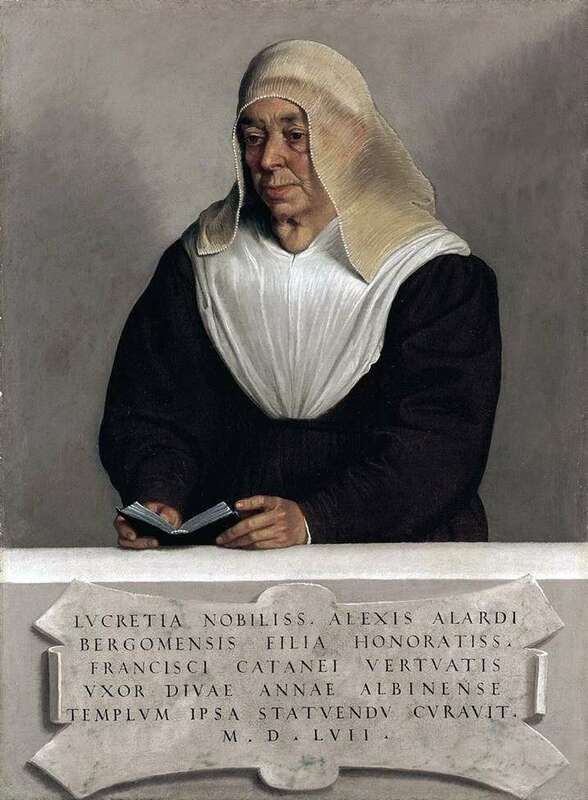 Despite the artificiality of the parapet highlighted with an elegant inscription in Latin, the canvas moves away from the strict stylistics of the official portrait: the face of the abbess, bearing the imprint of a ruthless time, does not reflect a shadow of arrogance or alienation. Her focused look and a hint of a slight smile give a feeling of sincerity and truthfulness. Description and meaning of the painting Abbess Lucretia Allardi Vertova by Giovanni Battista Moroni.